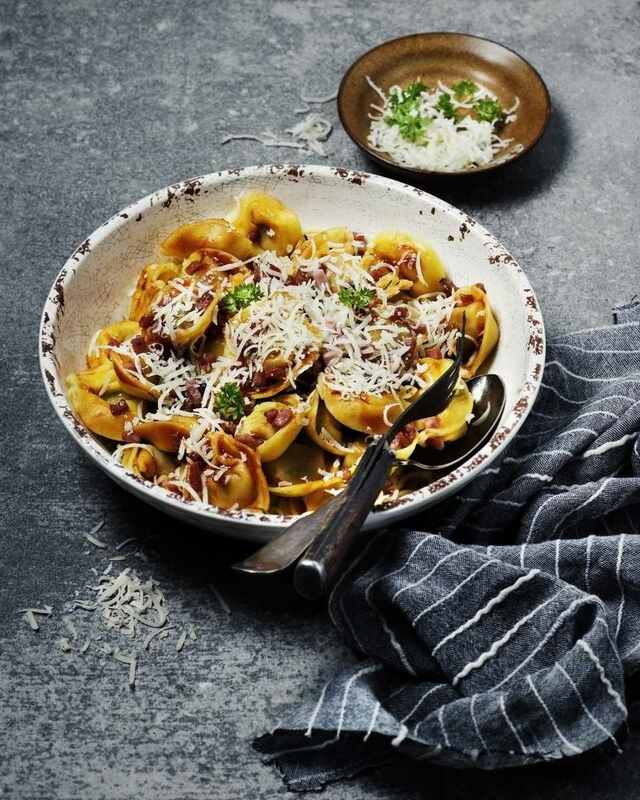 Baked Tortellini with Three Sauces is a very easy and rich pasta recipe that tastes like you spent hours in the kitchen. Serve it at your next dinner party! I developed this recipe because I wanted a dish using frozen tortellini that was more interesting than my usual standby, Red and White Tortellini. While that recipe is delicious and super easy, I needed something with more flavor. All you need with this wonderful recipe is a green salad tossed with mushrooms and grape tomatoes and drizzled with a simple vinaigrette. A glass of red or white wine would be perfect with this easy meal. Preheat oven to 350 F. Spray a 9" x 13" glass baking dish with nonstick cooking spray and set aside. In a large skillet, sauté sausage with onion, mushrooms, and red bell pepper in the olive oil, breaking up the sausage with a fork, until the meat is browned and the vegetables are tender. Drain, if necessary. Sprinkle flour over the meat mixture and cook for 1 to 2 minutes. Add the pasta sauce and water to the skillet and bring to a simmer. Remove the skillet from the heat and stir in the frozen tortellini and the pesto sauce. Spread in prepared pan. Top with the Alfredo sauce and sprinkle with the cheese. Bake for 40 to 50 minutes or until the casserole bubbles and cheese melts and starts to brown. Let stand for 10 minutes before serving.